According to Aden-based Yemeni "Saba" news agency President Abdrabbu Mansour Hadi issued decree on Wednesday which calls on the Parliament to convene.an extraordinary session in Yemen's eastern province of Hadhramout. It did not specify in the decree the date of the session of parliament or the city convening in. The Yemeni parliament is due hold its session in the next few days in the city of Sayoun of Wadi Hadhramout after President Hadi failed to convence session in the city of Aden, the initirm cabital of "legitimate" Government because of the rejection and threats of the armed southern transitional council supported by the United Arab Emirates. 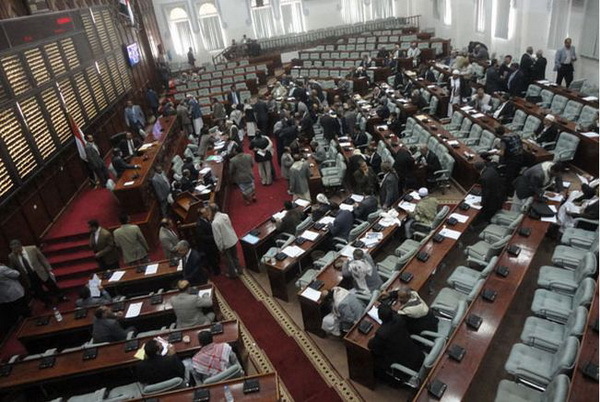 If the parliament sessions is to be convence in Hadhramout, it will be the first time the Yemeni parliament has held its sessions outside the capital, Sana'a, which is currently controlled by the Houthis group (Ansar Allah). This will also be the first time that the Yemeni parliament has been convened under the "legitimacy" of Yemen since the start of the war in Yemen in late March 2015.